It's Friday again! I can't believe it, this week has gone so quick. Actually these lovely holidays have gone too quick, I can't believe I start my full-time, grown-up, 9-5 job on Monday! I finished uni in November and foolishly thought these holidays would never end, not so. Anyway today I thought I would share with you some lovely handmade rings, because I have noticed that my jewellery collection is seriously lacking in the ring department and I may just be in the market for some lovely rings once that full-time salary kicks in! ﻿1. I love the contrast in this stacking ring set by Huismus on Etsy. Wear them together, wear them separately! 2. This ring by Julie Nolan is so sweet - a little silver twig ring for your finger. 3. A beautiful stacking ring set, featuring shiny silver in contrasting textures and finishes by Osiris Jewellery on Madeit. 4. I love the way this ring looks, randomly coiled with sections polished to a high shine and others oxidized to a matt black. It's available from Mariann Monika Jewellery Designs on Madeit. 5. This ring by Delezhen on Etsy is simple yet stunning. I just love the colour. 6. I love this ring set that reads "I am an artist", "Not a waitress" by Kathryn Riechert Jewelry on Etsy. There's a beautiful story behind why she made them which adds to the charm of this ring set (you'll have to follow the link to read it). I think they'd be very inspirational to wear at your unfulfilling, need-to-pay-the-bills "day job". 7. This whimsical ring just amazes me! It's made by Woodland Belle on Etsy who also has a great range of nature inspired pieces. 8. Another beautiful stacking ring set! This one is by Tinahdee on Etsy. 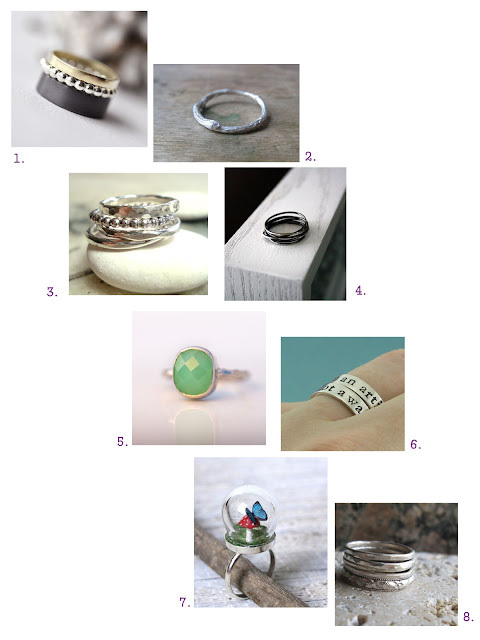 Thank you for adding my ring to your Fabulous Friday Finds!